With the professional assistance of Soft Tech, Envirotech Façade Solutions (EFS) has equipped itself to easily work with manufacturers using the latest CNC machining tools for the creation of custom architectural aluminium fenestration solutions. In a project lasting several months, Soft Tech developers have added milling operations for window systems into EFS’ database, allowing the Australian company to expedite its supply chain while readying for the manufacturing of the future. 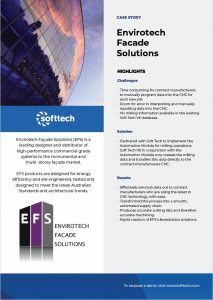 Envirotech Façade Solutions is a leading designer and distributor of high-performance commercial grade systems to the monumental and multi-storey façade market. Its products are designed for energy efficiency and are engineered, tested and designed to meet the latest Australian Standards and architectural trends. Once designed, EFS products are contract manufactured by a network of third-party organisations, several of which are implementing CNC (computer numerical control) machining solutions. EFS General Manager Steve Parkes says the company recognised the value in introducing automation solutions for those of its manufacturers which were starting to install CNC machines. “We wanted to modify our database so it could generate the right data for these machines, thereby accelerating the time taken and efficiency of production,” he explains. 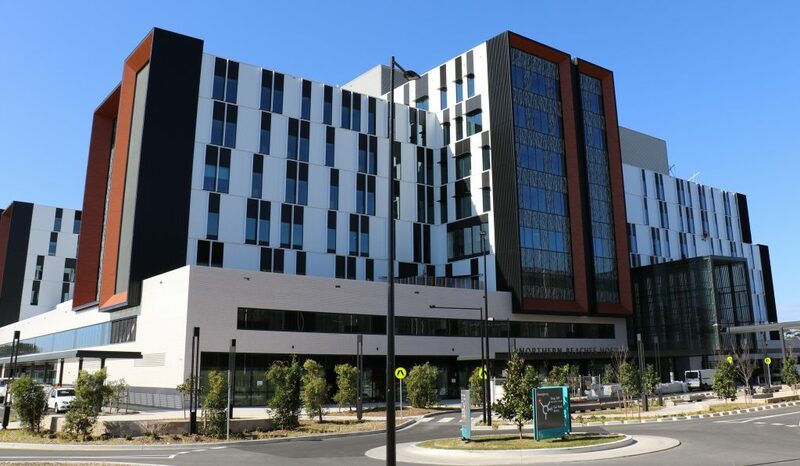 Providing background, Steve explains that EFS is a ‘boutique’ systems provider, providing custom and project specific façade solutions for high-end projects including multiple hospitals and commercial projects across Australia, like the recent Northern Beaches Hospital in Sydney. Northern Beaches Hospital (Sydney, Australia) where EFS supplied all the framing, glass and cladding products on this NSW Health prestigious project. CNC machines combine a motorised platform and tools controlled by a computer. Instructions are delivered to a CNC machine in the form of graphical computer-aided design (CAD) files. These are transformed into a sequential program of machine control instructions, and then executed. The challenge for Soft Tech’s software engineers was to create files within the V6 database which would allow EFS to send specifications for its systems directly to the CNC machines owned by the contract manufacturers. Demonstrating its flexibility and willingness to solve specific customer challenges, Soft Tech responded by putting a team of developers on the case. With four façade systems identified as routinely allocated to CNC manufacturing – including curtain walls and sliding doors – for which data would be required, Steve says the work involved creating everything from scratch. “That included assemblies, macros for notchings, drainage holes and the like,” he explains. Thanks to Soft Tech’s support, EFS is prepared for the future of manufacturing. It is able to send jobs to manufacturers using the latest CNC technology with ease, resulting in a smooth, automated supply chain and the rapid creation of its fenestration solutions. “With a bit of training and support, we have got the first few systems in curtain walls manufactured successfully and we are adding others, like sliding doors and fixed frame systems. The majority of what we are using CNC for is in the database now and it’s working well,” confirms Steve.